This Open Inventor application loads a data set, in this case a reduced version of the stanford bunny, and sends rays through the volume. It interprets the scalar data as the density and integrates it, producing white for high total density and black for low total density. (Total density is just the integration/sum of the density along the ray). The program keeps running, continually producing an ever finer display of the volume. However, over time, the results do not seem to continue to get better and I am not sure why. Maybe I am not scaling the radius the samples correctly. 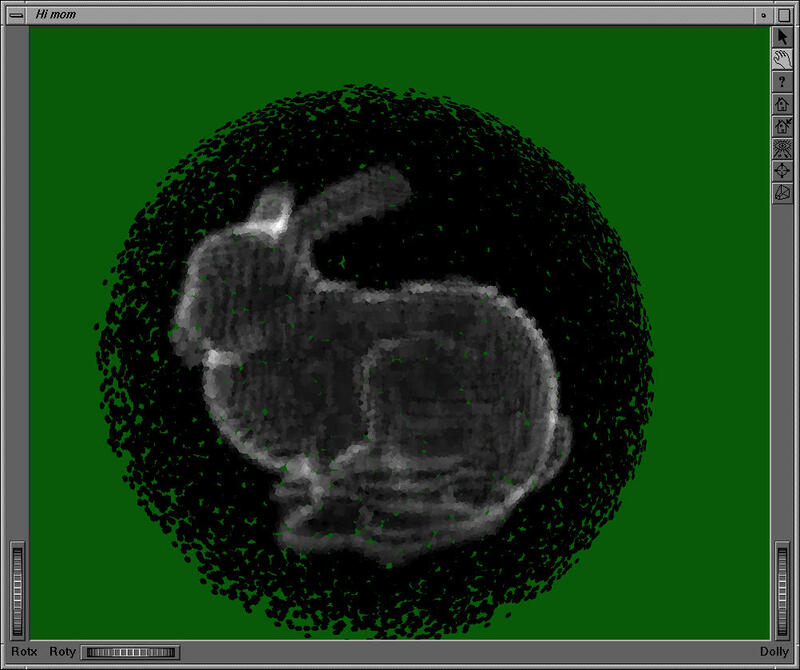 Anyhow, this program is hand tweaked to load the reduced bunny data set. Instead of including the bunny data set, I provide a link to the original source and the command I used to reduce it. Bunny MRI data can be grabbed from Stanford, and the reduction program from me. I would like to thanks Josh Grant and Dr. David C. Banks for letting me use their respective code (see tarball) in my program. This just shows a fly through of the data set.